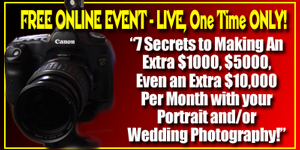 While You Listen... Feel Free To Sign Up For Our Upcoming FREE NEW Webinar (only your name and email address required) - it's titled "7 Secrets to Making An Extra $1000, $5000, even an extra $10,000 per month with your portrait and/or wedding photography!" Secret #1: The One HUGE Underground Secret That Almost No Photographers Know About –That Will Make You Thousands And Thousands Of EXTRA Dollars Every Month. Secret #2: How To Avoid The Three Biggest Mistakes In Photography Marketing And Advertising – So You Can Start Getting The Customers You Deserve Right Now. Secret #5: The Latest Website & Internet Insider Secrets That Will Make You Piles Of Money 24 Hours A Day. Secret #6: A Proven Promotion You Can Use Immediately To Bring In An Extra $5000 to $10,000 in just one month's time! Secret #7: The single Biggest Decision Of Your Photography Career And How, if done correctly, Will Make You More Money Than Any Other Decision You EVER Make. IF THE EVENT GETS TOO FULL TOO FAST, we reserve the right to shut down free registration, so don't wait. If you want to be sure to get in, sign up now.